The Brother MFC 6490 is all in one multifunctional printer which is designed to use for small offices but it can also be used as a home printer. The printer measures 13.7x 21.3 x 19.2 inches. It is quite heavy as it weighs around 34.4 pounds. The printer also offers wireless networking support, and still comes standard with USB connectivity. The printer can also serve as a Wi-Fi hub for direct connection over a network of computers. It has a large paper handling capacity (up to 400 sheets, standard). It is an economical choice when it comes to ink usage, especially with its high-yield Brother MFC 6490 Ink Cartridges. The output quality is typical for an inkjet. The texts are easily readable and characters are well-formed. The text quality is good enough for most business needs when Brother MFC 6490 Ink Cartridges are used. But it is less than the top quality that one would probably want for making the best possible impression in resume or most desktop-publishing output. The graphics on plain paper are good enough for any business use. Good print speeds of up to 35ppm and 28ppm in black and white and colour, respectively. A good choice for offices, because of its high monthly capacity. It has a large paper capacity. The Brother printer has low-yield standard cartridges, which makes the larger cartridges more economical to use. It lacks auto duplexing feature. The machine is a bit expensive for its class but is a good investment especially for work environments and households with multiple users.The printer can perform multiple functionalities such as printing, copying, faxing, and scanning. It is a little on the bulky side, especially since it can print wide-format documents like tabloids. Q. How do I install brother MFC 6490 Ink Cartridges in my printer? Remove the light-green protective part. Release the vacuum seal by turning the green knob on the yellow cap in the clockwise direction. Match the colour and carefully install the ink. Further, the machine will prepare the ink tube system for printing. This process will take a few minutes, have patience and do not turn off the machine. Take out a print sample to check the quality of your print. If you are refilling the ink, then clean the nozzle head to achieve good print quality. Q. Is Brother MFC 6490 printer very costly? A. The machine is bit expensive for its class, but is a good investment especially for small business and households with multiple users. It has proven to be an economical choice when it comes to ink usage, especially with its high-yield Brother MFC 6490 Ink Cartridges. Q. How do I configure wireless setting in my Brother MFC 6490 printer? A. In the menu select Network> WLAN> Setup Wizard> OK. The machine will search for available SSIDs. Use up and down buttons to select your SSID. If you are unable to find your SSID then you can add it manually as well. Click OK to connect with it. If your SSID is password protected then enter password and OK. It may take a few moments to get connected. If there is an error, then check for the connection error and repeat the process. Once your machine is connected to the network, your wireless connection is configured. Q. Where can I get good quality compatible Brother MFC 6490 ink cartridges? A. Printerinkcartridges.ie offers wide array of cartridges compatible for your Brother MFC 6490 printer at reasonable cost and money back guarantee. Q. My Brother MFC 6490 printer has run out of yellow ink. Do you provide yellow Brother MFC 6490 ink cartridges separately? A. Yes, we provide individual packs of all Brother MFC 6490 ink cartridge colours as well as multipacks with all the colours. Q. What are the dimensions of Brother MFC 6490 printer? A. The Brother MFC 6490 measures 21.3” in width, 19.2” in depth, 13.7” in height and weighs around 15.6 kg. Q. What type of paper can I use to print with Brother MFC 6490 printer? A. With the primary tray of the printer you can use letter paper, legal paper, ledger paper, executive paper, envelopes, A3 size paper, A4 size paper, A5 size paper, photo (4"x6", 3.5"x5", 5"x7", 5"x8"). With the secondary tray, you can use letter paper, legal paper and ledger paper. Q. I have compatible ink cartridges from my old Brother DCP-J715W printer. Will these ink cartridges work for my Brother MFC 6490 as well? A. Yes, you can use those cartridges for the MFC 6490. 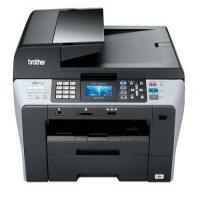 The Brother MFC 6490 uses the same compatible ink cartridge as the DCP-J715W, that is, the LC980. Q. What is the maximum print resolution of Brother MFC 6490 printer? A. The Brother MFC 6490 can print up to a high resolution of 6000 x 1200 dpi. Q. Does the Brother MFC 6490 support wireless printing? A. Yes, you can wirelessly print pages from this printer using your phone, tablet or computer as long as your device is connected to the same network as your printer. Q. How many pages can Brother MFC 6490 ink cartridges print? A. We provide original Brother MFC 6490 ink cartridges that can print up to 300 pages with black colour and up to 260 pages with other colours. Compatible Brother MFC 6490 ink cartridges come with a choice; 300 pages with black and 260 pages with other colours, or a multipack containing all the colours that can print up to 450 pages with black and 325 pages with other colours. Q. How do I install Brother MFC 6490 printer drivers on my computer? A. You need to use the CD-ROM that is provided with the printer. Read the Quick Setup Guide for detailed instructions on how to install the drivers on your computer. Q. Do all Brother MFC 6490 ink cartridges come with a warranty? A. Yes, all ink cartridges are warranted to be free from any defects. If you face a problem with any of our products, you can contact us on 048 308332211 or email us on info@printerinkcartridges.ie.